The ATOM Framework: An Idea to Develop an Enterprise Architecture Framework! I wondered on how an Enterprise Architecture framework could be developed in a way so it was practical and academic. Therefore I started on developing the ATOM-framework. I want to clarify that ATOM stands for Architectural, Technological, Organization and Managerial and as such the framework addresses all four aspects. The framework is based on that the enterprise (regardless if it is within the sphere of the public sector or the private sector) has to have a vision and a mission for why the enterprise is existing and what it should accomplish. The vision and the mission isn’t necessarily a statement on how to create profits but how to create value. Value can then be defined either as value through profits or value through the usage of resources or through the products or services the enterprise provides the customers or clients). Through the vision and the mission is the goals for what the corporate strategy should deal with. The corporate strategy is by that a tool (a plan) for how the enterprise should achieve its goals. From the corporate strategy a lot of so called sub-strategies can be identified e.g., the financial strategy, the HR strategy (workforce planning), communication strategy and technology planning. However there is one particular sub – strategy that differs from the rest of the sub strategies and that is the IT strategy & IT governance section. The reason for this is that the importance of Information Technology has increased dramatically the later years and therefore this particular form of strategy has to be regarded with great care. However the IT strategy & IT governance approach shouldn’t be based on the idea that the IT strategy or for that matter the governance section can stand alone. The assumption is that every enterprise has an architecture and as such the architecture is a necessity for that the enterprise can perform the activities that creates value. Every enterprise has an architecture but how the enterprise architecture can aid the enterprise with gaining a competitive advantage. For this the enterprise architecture has to be matured. When maturing the architecture then there are several issues that the executive team has to deal with the architecture to achieve better results that in time will enable the enterprise in achieving competitive advantages. The principle assumption is that technology is a tool that can be used to achieve better results for the enterprise e.g., computers, e-mails, and information systems. When speaking of technology then the enterprise can also be in a situation that ordinary technology such as cars, machines and other stuff that is used to make the employees, managers and top managers in achieving the goals and visions of the enterprise. The enterprise consist of people. People have to change the way they do their work, interact with one another and think when they work. All in all the behavior the employees act after is the paradigm. The managerial aspect of the framework deals with how the executive team of the enterprise deals with the decision making in how to apply the changes needed to enable the enterprise in achieving its goals and thereby its transformation processes. If the executives do not support the transformation processes through anchoring their decision making through embodiment through their actions. The assumption of the corporate strategy is that strategy can be both what is articulated in a particular plan but it can also be the way the strategy is implemented through the actions taken by the executives, middle managers and employees. The initial phase of the framework is based upon the idea that architecture is the driving force, then technology will enables, organization is build upon adjusting the behavior of the members of the enterprise (managers, middle managers, employees etc.). When implementing the framework then it is a necessity to think that the framework and the concept of enterprise architecture needs to be supported by the management (managerial) and therefore the managerial column has been rearranged. Secondly to that then technology is an enabler for achieving competitive advantage and therefore it shouldn’t be considered as secondary. Then why is architecture in front of the organization and managerial level? The reason for this is that all enterprises have an architecture and when the architecture is matured then the enterprise is able to achieve better results from its managerial, organizational and technological elements. The Practical Approach to the Framework. This leads to the principles of the architecture. The architecture is the driver for change in the enterprise. The architecture needs to be uncovered so the executives and the assumed chief architect can define what projects that are needed to make the enterprise more able to adapt to its environment, be more efficient and making the enterprise architecture able to achieve its goals. The architecture aspect deals with identifying various artifacts that already exists in the enterprise. The focus will be on artifacts such as the current corporate strategy, IT strategy, financial strategy and work force strategy. Likewise will artifacts such as concepts of operation, business models diagrams, documents on IT-governance, and documents on how the enterprise adds value to its customers. When speaking of IT governance then business cases, project descriptions and documents that creates an overview of how the IT and business projects are aligned have to be uncovered. It is worth to mention that if the enterprise hasn’t articulated the various artifacts then the chief architect among others have to develop the artifacts. The Architectural Aspect of the Framework. When working with classifying the architecture it might be a help for the enterprise architect to assume that the corporate strategy is the driver for how the various projects within the framework that the enterprise (organization) is. 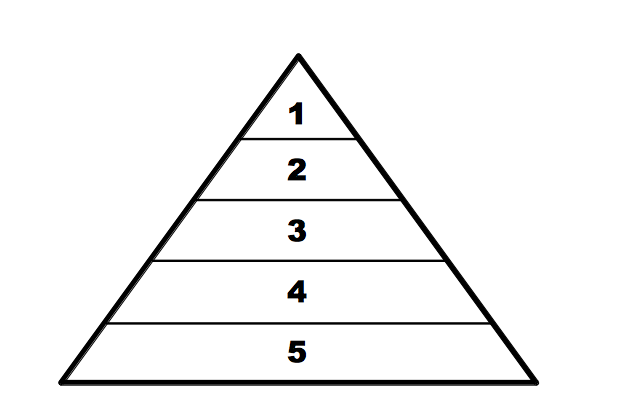 The ATOM-framework it can be assumed that the enterprise somehow is organized like an ancient egyptian pyramid. The first level deals with the management of the enterprise and as such with the formulation of the corporate strategy. The second level deals with the business models and business processes of the enterprise. This deals with how the enterprise creates value to its customers (or clients). The third layer deals with the business to IT alignment phase. This means the enterprise focuses on making their IT work as intended. The fourth phase deals with the information related artifacts e.g., how are the information systems and databases designed. The information systems process the information that is stored in the database. The fifth layer is build upon the idea that every other layer in the enterprise is related or build upon the usage of Information Technology. When the artifacts have been categorized then they have to be organized into a what is called a repository that can be used to communicate the various artifacts to the various stakeholders and actors with in the enterprise. This will enable the holistic view on how the enterprise functions and how the enterprise should be changed. As such the assumption is that the executives in the enterprise that articulates the corporate strategy and as such all the other strategies have to be aligned with the corporate strategy. Artifacts that can be identified are the corporate strategy and the elements therefore e.g., the enterprise strategic portfolio. What are the goals of the enterprise and how can it achieve the goals? The strategy can be driven both through a formal strategy as well through and embodiment of the actions of how the executive team works. 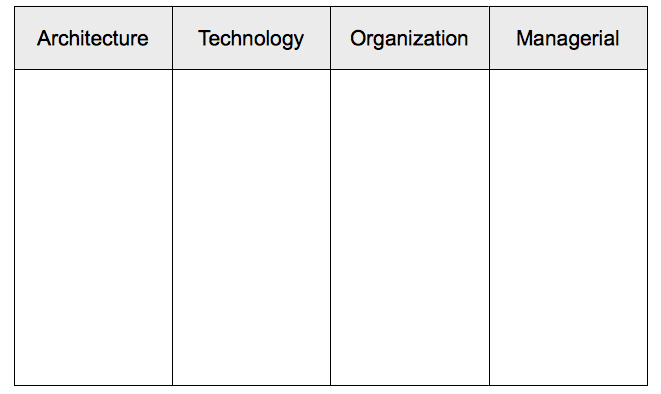 The artifacts at this level are the business model (or business models), concept of operations and business modeling. The artifacts within this level are lists and specifications of how the enterprise’s business processes and business projects are aligned through the IT projects. This level is characterized through the identified information systems and databases systems. The databases have to be categorized and the usage of the enterprise’s databases. Artifacts that can be identified are database diagrams, E/R-diagrams and Information Systems diagrams. IS-diagrams includes maps & diagrams of ERP and BI systems. This level deals with that technology that is used in the enterprise to enable the enterprise to create the products or services they sell. It is notable that technology as such also can be supportive for internal processes in the enterprise. Technology can be both the ‘ordinary’ forms of technology such as machines and the newer forms of technology such as Information Technology. Artifacts that can be identified in this level is network diagrams, Obashi diagrams, switch diagrams etc. The executives have to understand and to work with the issues of Enterprise Architecture and as such the managerial team (executives and middle management) of the enterprise have to act accordingly to the corporate strategy. As such the managerial actions have to reflect the corporate strategy (embodiment of strategy) and the program for Enterprise Architecture has to be anchored to the executive group so resources and responsibilities can be allocated. The Enterprise Architecture group should be given the resources to establish its self and the document and ultimately change the way the way the enterprise (and thereby the members of the enterprise e.g., executives, managers, project leaders, workers etc.). As such the organizational approach needs to be dealt with as well before the concept of enterprise architecture and coherent governance can be achieved. Within the group of people who will work with the enterprise architecture there have to be certain roles e.g., Chief Architect and ordinary architects who have to work with identifying or developing the artifacts needed to implement a repository. The Chief Architect can be identified as the person in charge of choosing the framework, modifying and giving the necessary responsibilities to the architects. 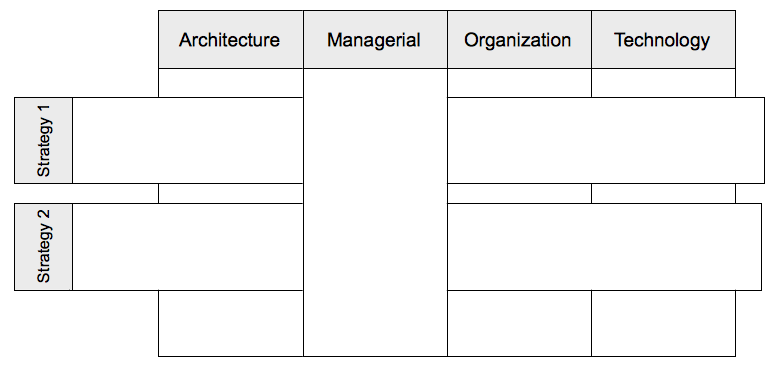 Depending on the maturity of the enterprise architecture there are different forms of architecture. The technology aspect deals with that the enterprise make use of technology to produce or aide the production of services the enterprise in some way or the other with production of the services. The aspect of technology is it needs to be utilized and applied to alter the business processes more effective than they were before the processes were re-engineered. 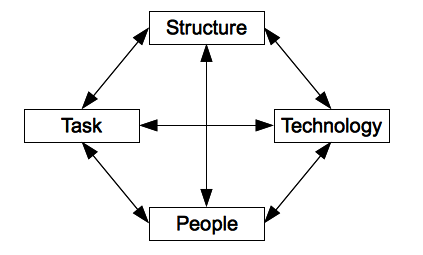 As such the aspects of technology needs to be measured and benchmarked so the economic benefits of deploying the technology can be justified and the individuals, groups and committees that are responsible for the implementation are hold responsible for the benefits that where estimated before the enterprise chose to implement the the particular technology (through an business based IT project or program). The technology aspect has to be aligned with the managerial and the organizational aspects due to so technology generate the greatest amount of value for the enterprise as possible. However it is notable that if the enterprise and the enterprise architects as such assume that operational efficiency is the key to achieve competitive advantage then they have to refocus their attention. According to Porter then the focus of how to achieve a competitive advantage then the sole focus on operational efficiency will not result in a competitive advantage (Porter 1998). When the enterprise architecture is changed the focus has to be on how the members of the enterprise (executives, middle managers and employees) think and behave. Therefore should the enterprise architects focus on elements from the field of organizational theory and organizational change. E.g., it is almost universal that a communication plan has to be developed so the chief architect a long side the executive team can communicate to the stakeholders on why the change (adaption of Enterprise Architecture) is needed and the communication needs to address the changes over time and that the members of the enterprise needs to be reassured on that they are doing the right thing and the change (as an overall program) is unavoidable. Kotter (Kotter 1995) addressed the aspect of communication as one of the key failures that lead to lack of change in enterprises. In a response to communication should an attempt to change be based on communicating facts and feelings (Kotter 2008). Culture as such consist of ideas and feelings that are shared among a certain group of individuals (members of the enterprise) and to impact these feelings then it is a necessity to impact the feelings. Among these feelings are the feeling of winning the one that needs to be emphasized in the communication. Besides the impact on how to impact the organization culture then the enterprise needs to restructure the organizational hierarchy so it is possible for the Chief Enterprise Architect and the Enterprise Architects can implement the changes needed without being undermined through other factions in the enterprise. Ideally should the Enterprise Architecture group be assigned to be working with or under the Chief Operations Officer since Enterprise Architecture should be generating the benefits of generating the overview that is necessary to initiate coherent improvement programs. If the Enterprise Architecture group is located under the CIO then it will often lead to a too IT-focused EA – approach that is implemented. When thinking of the success of the strategy that the enterprise has to implement then it is a need that the enterprise takes all of the four aspects into consideration. Leavitt (Leavitt 1965) designed the diamond to represent that when a task has to be changed then the structure of the organization and the way the employees acts has to be changed and like wise does it impact the technology that is applied in the organization. It is fundamental that the policy makers and the strategists takes this into consideration and that can be done through applying Enterprise Architecture and using the ATOM-framework. Enterprise Architecture can be considered both as an form of documentation but also as a form of governance. Bernard (Bernard 2005) and later Doucet et al. (Doucet et al. 2009) defined EA as form of governance that would make the enterprise better suited to adapt to its environment. The focus of the ATOM-framework has to be considered as an all around approach on how the strategies (corporate strategies) impacts the various other components and levels of the enterprise. When it comes to development of enterprise architecture and the ATOM-framework then the question of how Enterprise Architecture can enable the employees to contribute more to the enterprise through their passions and creativity, how the enterprise can be assure that their procedures and policies enables the enterprise to achieve its goals. For that further research into Coherency Management (the extended approach to Enterprise Architecture) has to be investigated in case studies. The same can be said about the ATOM-framework and likewise should the further development of the ATOM-framework support complex issues of employee motivation & behavior, artifact categorization & establishment, and management innovation. Likewise does the framework need to be tested in a series of case studies to first of all be tested and as such be improved when the flaws of the framework desig are discovered and dealt with. Doucet, G. et al., 2009. Coherency Management: Architecting the Enterprise for Alignment, Agility and Assurance, International Enterprise Architecture Institute. Kotter, J.P., 1995. Leading Change: Why Transformation Efforts Fail. Harvard Business Review, (March – April 1995), 9. Kotter, J.P., 2008. A Sense of Urgency, Harvard Business School Press. Leavitt, H.J. , 1965. “Applied organizational change in industry: structural, technological and humanistic approaches”, in: Handbook of organizations, edited by J.G. March. Chicago: Rand McNally. Porter, M.E., 1998. On Competition, Harvard Business Review, Boston, p.40-42. 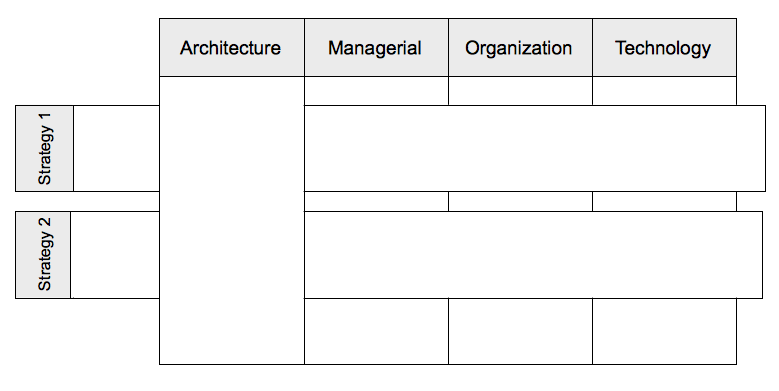 Previous A Compendium for Understanding Enterprise Architecture. Next The Breakout Strategy: A Review by a Coherency Architect.